When it comes to losing weight, muscles play a vital role. According to the studies, people with more muscle usually burn more calories compared to those with less muscle in their body. This is because our body needs more energy to build muscle and in that process, it uses the stored fat to improve your muscles. As a result, you burn more calories and lose weight much quicker. However, in order to build muscle, we require enough protein content. 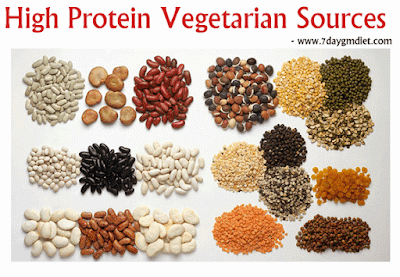 You can easily get protein from non-vegetarian foods like chicken, beef, eggs etc. But, what if you’re a vegetarian? Most people out there think that they can get protein only from the non-vegetarian foods, which is completely false. It was actually a marketing gimmick played by the vendors in order to increase their meat sales. In reality, protein is also available in the vegetarian foods, but you’ll need to consume a higher quantity of them to match the protein content of the non-veg foods. According to the USDA, an average sedentary person should consume 0.8 grams of protein per KG of his/her weight per day. That means, a 80 KG person should consume 80 x 0.8 = 64 grams of protein per day. If you’re practicing any strength training routine, then this should be increased to 1.5 grams, which becomes 80 x 1.5 = 120 grams of protein per day. Listed below are the top 10 vegetarian foods high in protein content and low in calories. So, if you’re on a weight loss mission, then you can include these foods in your low calorie high protein diet without any worries. A simply 100 grams of cottage cheese contains around 11 gm of protein. It is one of the non-expensive foods that is rich in protein content for muscle building. It also contains ample amount of calcium for strong bones. If you can’t eat it separately, then try to mix it with your favorite fruits and vegetables to make it a great dish. However, make sure you choose the low-fat version if you’re trying to lose weight. A 100 grams serving of soy milk contains 3.3 gm of protein and 1 cup (243 g) of soy milk has about 8 gm of protein. If you don’t like drinking regular milk, then you may opt for soy milk. You also get 118 mg of potassium from 100 gms of soy milk. If you don’t like to drink it, then you can consume boiled soy beans instead. A single Oz or 28.4 grams or 23 whole almonds contain 6 g of protein and 160 calories. They’re also rich in Magnesium. Remember to soak the almonds overnight in water and remove the skin before eating. Another good thing about the almonds is they’re good for the heart, thanks to the monounsaturated fats provided by them. If you want your food to be delicious and at the same time, don’t want to miss the protein content, then the Greek Yogurt is the one you should get. A single serving (170 g) of nonfat Greek yogurt contains 100 calories and it provides a whooping 17 g of protein. So, if you’re particular about your weight loss diet, then you can include the yogurt without any worries. It is also rich in Sodium (61 mg) and Potassium (240 mg). If you’re looking for the best vegetarian source of protein, then Peanut Butter can be included in your diet without any second thought. You get 8 g of protein from just 2 tbsp of peanut butter and it contains around 180 calories. Most people use the peanut butter to enhance the taste of their breast toast (brown bread is recommended) and some body building enthusiasts also add it to their protein shakes or smoothies to increase their protein intake. If you’re a vegetarian or a non-vegetarian who dislikes meat (beef etc), then Tofu is the best alternative to meat. You get 11 g of protein from a single serving (150 grams) of Tofu, while the Tempeh (chewier version) provides 15 g of protein. You can include any one or both in your diet depending on your protein requirement. Since ages, different varieties of lentils and beans are included in the Indian diet, thanks to their nutritional benefits. Beans such as kidney beans, chick peas, black beans and baked beans are very good sources of protein. They contain around 13 to 15 grams of protein, in addition to the fiber content. Likewise, Lentils are also rich in protein and iron content. So, it is always suggested to include different types of lentils and beans in your everyday recipes to get enough or recommended protein per day. Nuts are usually high in calories, but at the same time very nutritious. So, to get enough protein per day, you can include different nut varieties of your choice, but in smaller quantities. Likewise, seeds such as pumpkin, peanuts, pistachios, chia, walnuts etc… contain around 7 to 8 gms of protein per serving. If you’re allergic to soy products, then you can consume Hemp seeds. They give 3 gm protein per 1 serving. However, please remember to control the portions as excess consumption may lead to weight gain. 1 cup or 195 g of brown rice (cooked) contains 5 gms of protein and gives you 216 calories of energy. Replace your white rice with brown as it is nutritious and also high in dietary fiber, which is beneficial for those who’re trying to lose weight. I personally prefer eating brown rice with lentils and beans of my choice to get enough protein per day. 1 slice (28 g) of whole wheat bread provides 3.6 g of protein with 68 calories. So, to get 15 g of protein, you can have 4 slices of bread. It is recommended to add peanut butter to your bread toast and have it for breakfast every day. The high protein content in the toast will help you fight food cravings until your next meal so that you don’t overeat. That’s all friends! Hope this list of the high protein vegetarian foods will come handy for you. Get your daily recommended protein content from these foods and at the same time, lose weight naturally by following a low carb high protein diet.